Testing, prelocation and pinpointing of sheath faults. Easy, precise and fast. The intuitive, menu supported operator guidance of the MFM 10 works using the well accepted SebaKMT Easy-Go principle. 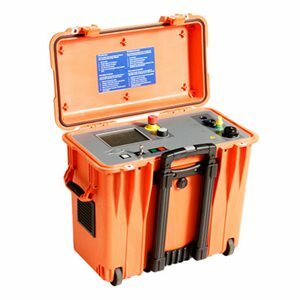 The fully automatic measurement and evaluation of the measured data gives the operator a fast, easy and reliable tool to test the sheath of cables, and to perform a prelocation and pinpointing of detected faults. The bipolar prelocation supports the detection of galvanic and thermoelectric influences and increases the prelocation accuracy and quality.